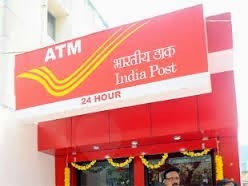 NEW DELHI - March 1 : Postal bank savings account holders in Delhi can now avail of ATM services as India Post today launched automated teller machines at two locations here. The department will open 2,800 more such ATMs by March 2015 which is part of its core banking system (CBS) project. The initiative is part of modernisation project under which around 1.6 lakh post offices will be equipped with core banking system by 2015, Communications and IT Minister Kapil Sibal said while launching ATM at ITO post office. The other ATM has been opened at Kashmere Gate PO. Finance Minister P Chidambaram inaugurated the first ATM of India Post network in Chennai on Thursday. "Its not a short journey. It will take time but we have started this journey. There will be about 2,800 ATMs installed by March 2015," Sibal said. "Some people only talk about common man but we are among those who work for common man without making noise. This ATM is for 'Aam Aadmi' at a common man's post officer. This is a gift for Aam Aadmi and I congratulate Aam Aadmi," he said. The department is issuing ATM cards to postal savings bank account holders through which they can withdraw money. "The ATM will serve only Post Office customers for first 6-8 months. After that we will link it with ATMs of other banks. Thereafter customers of any bank will be able to withdraw money and our customer will be able to use other ATM," Delhi Circle Chief Post Master General Vasumitra said. Delhi will get 86 more ATMs by the end of this month and around 600 by 2015. India Post has connected about 64 lakh savings accounts across seven states - Delhi, Uttar Pradesh, Tamil Nadu, Karnataka, Maharashtra, Assam and Andhra Pradesh -- in select branches with CBS. The department has also applied for banking licence. "I am trying that Post Office should get a banking licence to serve common man in rural area. I will keep by struggle on for banking licence," Sibal said. India Posts also announced linking of Postal Life Insurance service which has corpus of close to Rs 40,000 crore with CBS that will enable people to pay premium online, check status of their policy. India Posts has plan to roll out core insurance solution like CBS at pan-India level under which it will integrate 810 insurance processing centres for faster claim settlement and after sales service. Under the insurance project, 11,000 post offices will be migrated to new technology by September 2014 and about 14,000 post offices by March 2015. The government has earmarked about Rs 5,000 crore for modernisation of post offices which also includes equipping all branches with real time banking facility using service of private companies.